Dry, cracked skin. With weather conditions dropping to below 30 degrees some winter days, we need to prepare not only to bundle up but to take care of our skin. 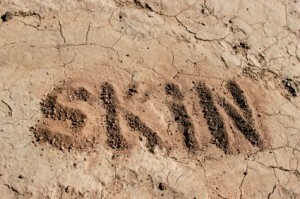 October, November, and December are known as the skin “danger zone” months. During these months our skin is hit with harsh winds and conditions that strip the skin of its natural moisture barrier; causing the top layer of skin to dry, and flake off. It’s not too late to save your skin. A great body wash and moisturizer are essential. Health Magazine, suggest first that you keep your showers short in the winter. No more than ten minute increments for each shower—long showers aid in stripping your skin of its moisture. Use a rich, moisturizing bath soap that leaves a creamy, oily film on the skin. They suggest C. Booth Original Bath & Body Oil ($10; Ulta) which has a mix of natural oils: olive, sesame, sunflower and evening primrose. Another bath soap I would suggest helps skin rejuvenation and decreases wrinkles. AHA/BHA Exfoliating Cleanser a product from the Myo Essential Body Care line of company Myo Technologies. This product contains Glycolic Acid an exfoliate known to trigger the production of collagen while increasing cell turnover. Their skin care line is great for men and women, ages 30-60 but definitely can be used by all ages. It’s never too early to start wrinkle reduction! If you don’t feel like ordering online try Dove Deep Moisture Nourishing Body Wash, I personally use this one and it works wonders, along with any Nivea Skin Care products. –Bert’s Bees Naturally Nourishing Milk and Honey Body Lotion -milk, honey and other oils is what makes this lotion a dry skin fighter. Bert’s Bees make a lot of different body products so be sure to look at their website; their lip balm is amazing. – Restorative Marine Moisturizer– If you’re struggling with dehydrated skin this season, this product would work wonders for you. Made from red marine algae, this formula shows an increase by 20% in firmness of skin and skin feels 70% more moisturized and hydrated in just four weeks. This is another product from the Myo Essential Body Care line. – AmLactin Moisturizing Body Lotion– this lotion contains 12 percent lactic acid lotion and can be found at any local drugstore. Milk is said to have high moisturizing qualities so you might want to try it out. –Ole Henriksen Skin Insulator Crème – this cream was made for cold weather protection with borage seed oil, which helps skin repair itself and is a natural source of fatty acids. This thick cream will leave your body feeling great and “insulate” the skin. –Ole Henriksen African Red Tea Self Heating Body Souffle– a body cream that contains a self-heating ingredient which speeds up stimulation and penetrates muscle. The smell of citrus oils and pumpkin extract will arouse your senses as your body indulges in these deep moisturizing properties. Don’t forget to bundle up, add some milk and honey to your skin regimen and also don’t forget about the other two important factors: sunscreen and lip balm. Your SPF should be 15 or higher. These tips should help your skin stay smooth and moisturized throughout the winter months. For more tips visit The Daily Green or Discovery Fit and Health.